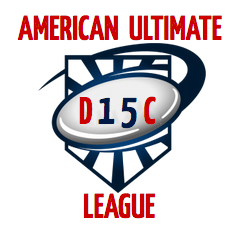 Here are design concepts attempting to combine "2015" and American Ultimate Disc League. Can't unsee D15C! Our submission to Get Horizontal's #THROWVEMBER, which is almost as much fun as this fall month. With Thanksgiving approaching, it's inevitable conversation will lead you to having to describe "Ultimate Frisbee" to a family member. The game is played 7 versus 7 with 70-yard fields and 20-yard end zones. The scoring is similar to football, by passing the disc up and down the field to score in the end zone. However, you cannot run with the disc once you receive a pass. "Ultimate," as it is casually referred, is a non-contact sport, but collisions and injuries are inevitable. The game is self-officiated, so sportsmanship and honesty are two main components of Ultimate. Ultimate is constant movement. It mimics sports like football and basketball — there's a lot of sprinting, change of direction, agility. It takes a lot of hand-eye coordination. It also demands flexibility, endurance and proper hydration. In sports terms, ultimate Frisbee combines the nonstop action and athletic endurance of soccer with the passing skills of football. Played on a field similar to a football gridiron, the object is to score by catching a pass in the opponent's end zone. Ultimate frisbee is a mixture between Australian Rules (AFL), netball and gridiron. The game is self-refereed meaning there are no referees. The game is played on a rectangular field that is 100 metres long with a maximum of seven players on the field at one time. The object of the game, like gridiron, is to move the disc down the field and into the end zone. Ultimate frisbee, where teams of seven race to pass the frisbee to a player in the opposite "end zone". There's a lot of running, falling over and skidding, a bit like American football, without the bruising macho element. "Playing a game of Ultimate Frisbee actually resembled a game of rugby, only that there was no contact between players and a disc in place of a ball. Teams start out at their end of the field, when the defence team throws the disk as far away from the opponent's "end zone" as possible. The "end zones" are on each ends of the field, equivalent to the space behind the "goal line" in American Football. The offence team then may pick up the disc and start making their way across the field by throwing the disc from player to player. 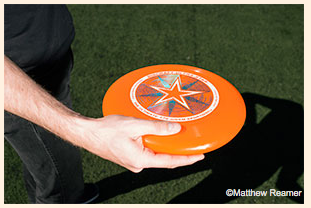 Those holding the disc may only pass it on by throwing. Each team earns a point by successfully catching the disc while standing in the "end zone". However, if the disc drops at any point, possession changes. The winning team is the one that scores the highest number of points in a fixed amount of time, determined before the game, or the first team that reaches a certain predetermined number of points, before that time had passed." Do you read or have you visited this SLUDGE blog? And/or, follow SLUDGE via twitter?? And/or, RT'd or favorited any SLUDGE tweets? And/or, shared any SLUDGE posts with others??? 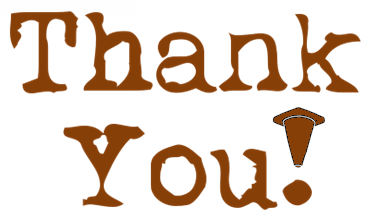 Sincerely, a huge "Thank You!" to you. Data show that the sport of ultimate is popular. Currently, Ultimate players needing cleats wear cleats designed for other sports. 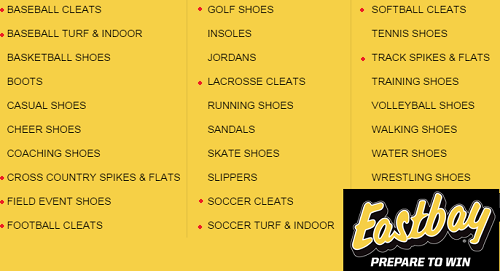 Cleats exist for individual sports like baseball, cross-country, football, golf, lax, soccer, softball and track. Cheerleaders have their own shoes! Disc golfers have specialty footwear. Even coaches have their own kicks!! The sport of Ultimate has been described with characteristics of basketball, soccer, tennis and football. While each of those sports have distinctive design features for their sport's footwear, shouldn't Ultimate?? 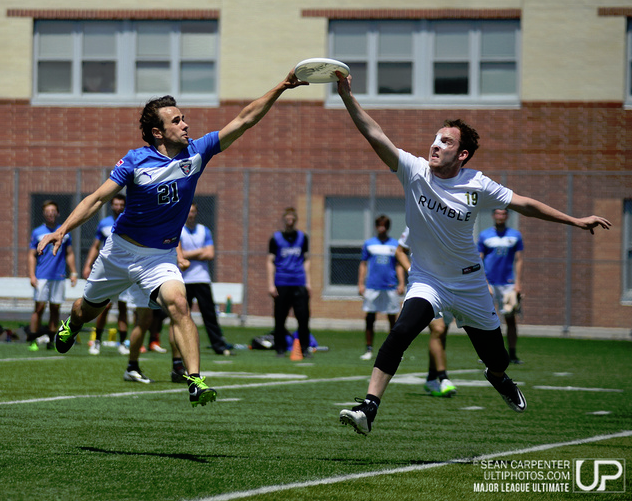 The feats of Ultimate - as a sport - deserve attention and so, too, Ultimate players' feet. Here is a random collection of images from the American Ultimate Disc League (AUDL) & Major League Ultimate (MLU) teams during the 2014 pro Ultimate season. Thank you to all photographers who capture the sport of Ultimate. Special appreciation to UltiPhotos. If your treadmill is the ultimate field, then you may interested in this prototype. 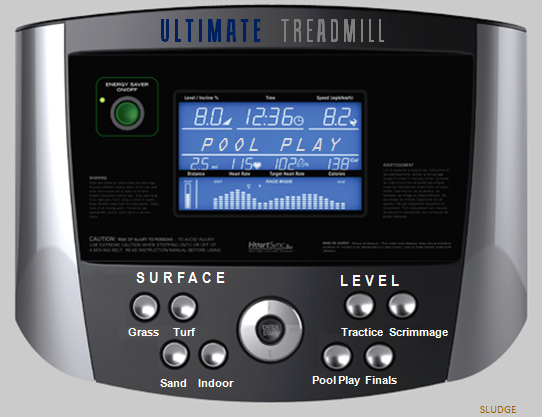 This treadmill is designed for ultimate players offering four surfaces - grass, turf, sand, and indoor, plus four levels - tractice, scrimmage, pool play, and finals. An attachment of an ultimate disc for the front of the treadmill may be sold separately. 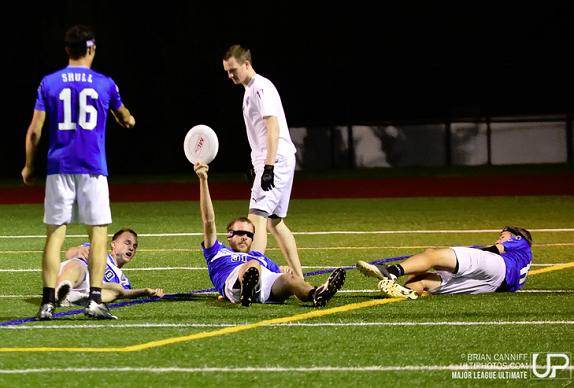 Nathan Jesson published his offseason questions for the American Ultimate Disc League. Seven questions for the league as they move into their 4th season. In the West Division, Salt Lake City Lions went winless (0-14). In the Midwest Division, Detroit Mechanix also went winless (0-14). In the East Division, Rochester Dragons and Philadelphia Phoenix went a combined 0-22 against the rest of the division. 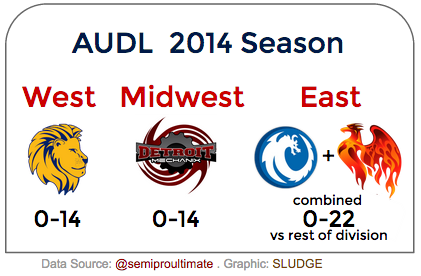 RELATED: AUDL 2014 season snapshots. 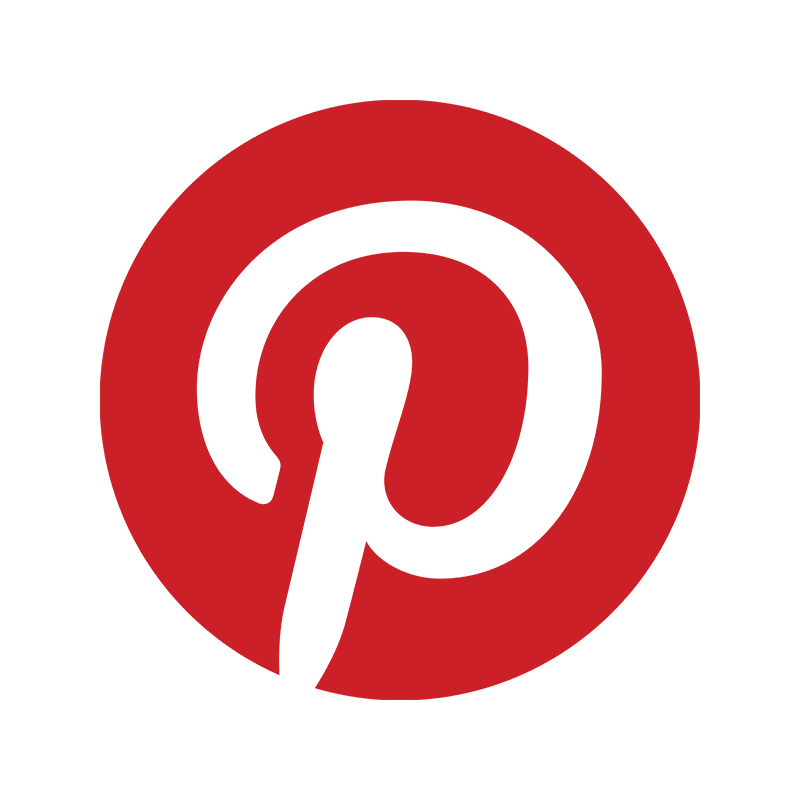 Did you know one of the founders of Pinterest played Ultimate in college? Hannah Kuchler met up with Evan Sharp, the co-founder of Pinterest, to get a frisbee throwing lesson. They met on a field in San Francisco where as Sharp explained his Pinterest Ultimate frisbee team "beat Square and Twitter last season." The online social network is currently valued at $3.8 billion. The article includes this great quote from Evan Sharp: "When I have free time, which I wish I had more of, playing frisbee is a great way to get outdoors and have a bit of fun." The August FT article adds this nugget that while at University of Chicago, "Sharp was a college champion at ultimate frisbee, where teams of seven race to pass the frisbee to a player in the opposite "end zone". There's a lot of running, falling over and skidding, a bit like American football, without the bruising macho element." The published piece also mentions that he plays disc golf. 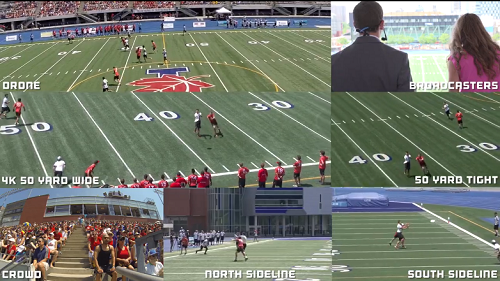 Kudos to the camera work, production, and editing of Frisbee-Trickshot-turned-Campus-Tour video! On a recent Late Night with Seth Meyers, Jack McBayer was asked to rehash a story from 2008 about a Frisbee. Seth Meyers (who happens to have a dog, Frisbee) asked Jack about the flying disc incident that occurred on the set of a Mariah Carey's music video. After the story, Seth asks: "Nobody asked you to play Ultimate Frisbee either?" Watch the referenced (2008) video of "Touch My Body" where Mariah Carey throws a flying disc with Jack McBrayer. Screengrab of Mariah Carey tossing a Frisbee. A comparison of how the 12 U.S. club ultimate teams finished at the two prestigious ultimate tournaments in 2014 - WFDF's World Ultimate Club Championships (August 2014) and USAU's Triple Crown Tour National Championships (October 2014). 2 teams finished the same at Nationals and at Worlds - Drag'N Thrust (1st) & FURY (2nd). 4 teams finished better at Nationals than at Worlds. 5 teams finished worse at Nationals than at Worlds. 1 team that played at Worlds did not qualify for Nationals. The 3rd place team at Worlds in the Men and Women's division both finished 1st at Nationals - Johnny Bravo & Scandal. Salt Lake Lions have always been verbose with their tryout details; last year, they posted a full job description for a professional Ultimate player. To prepare for the 2015 AUDL season, the Lions posted some general details for all ultimate players, and then got really specific about the "type" of player they seek for the rescheduled November 15th combine. Salt Lake Lions 2014 Combine! This year's Combine will be longer, harder and will require even more of our athletes. We've restructured the event to have less down time, more action and a more impressive outcome. There are only 28 spots on the Lions roster - do you have what it takes to fill one? To find the best talent from the surrounding mountain states and the Big Sky region! To put that potential to good use, make a name for Ultimate in Utah and propel the sport into the future! Among other things, the Lions staff members are looking for throwing ability, field awareness, in-game decision making and grace under pressure. Although the staff is particularly deft at recognizing potential, you should be in good physical condition at the time of the Combine. We expect you to have a regular workout regimen and to know the rules of an AUDL game - you will be playing in a refereed AUDL-style game during the Tryout. 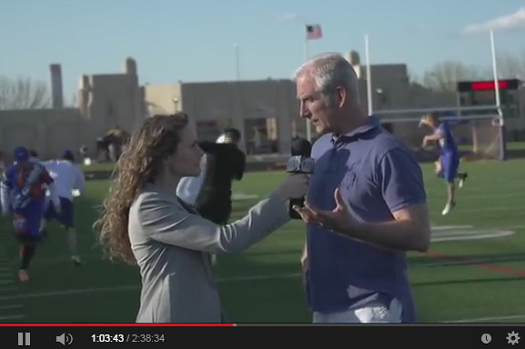 "Yes, women can compete in the AUDL - we'd like to be the first team with a professional female player. If you're a woman, ask us about a discounted rate!" 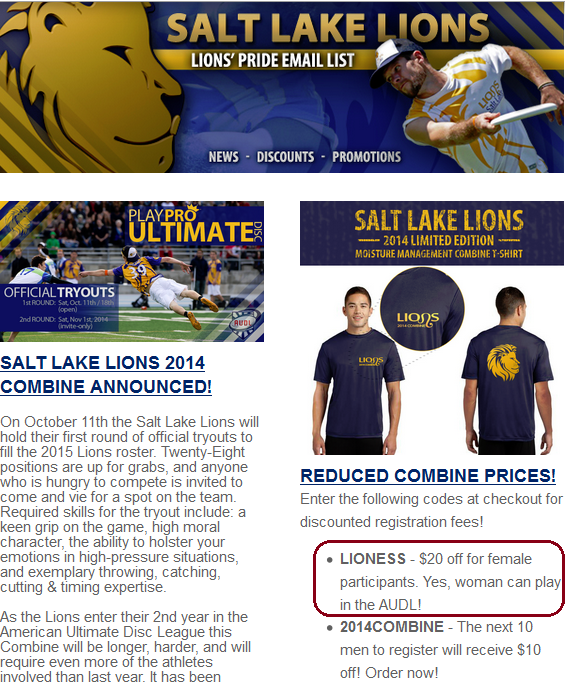 In Salt Lake's September 2014 e-newsletter, the Lions offer two types of discounts - one for males; one for females. The item under REDUCED COMBINE PRICES reads: "LIONESS - $20 off for female participants. 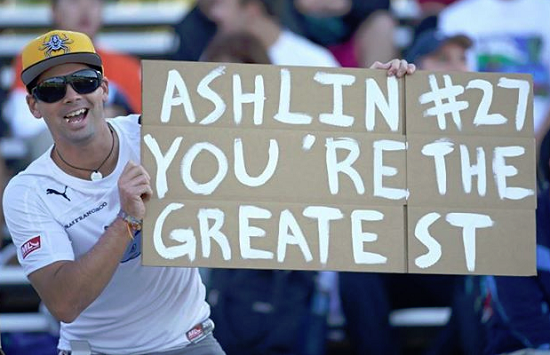 Yes, woman [sic] can play in the AUDL!" That's right, women ultimate players even get their own discount code of "LIONESS." Get it? (Because lioness is a female lion.) Is this discount kind of sexist? 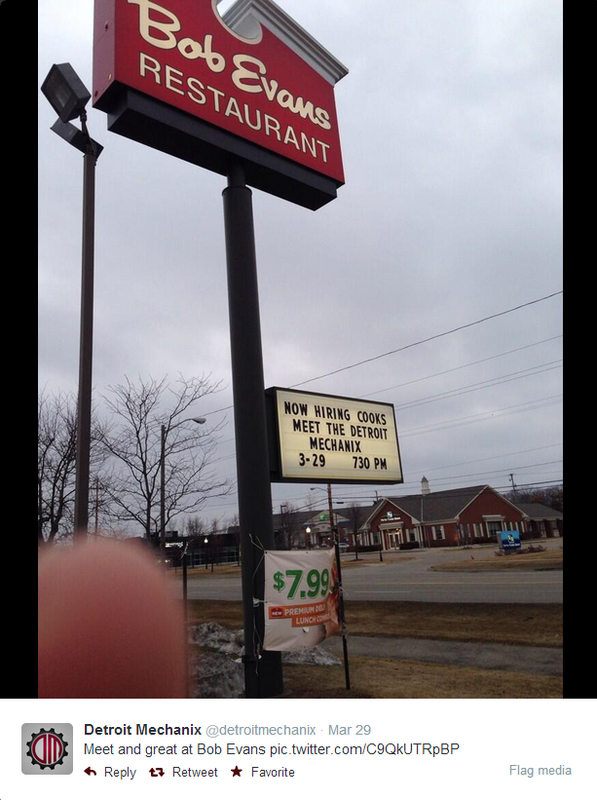 A discount for college students, okay; but, this discount is not dissimilar to a ladies' night bar promo. I'm all for encouraging females to play in any/all levels of the sport of ultimate. However, this is an overt approach by the Salt Lake Lions where the motivation is misguided as organizational gain (hey, we wanna be first!) rather than unconditional support of women players. 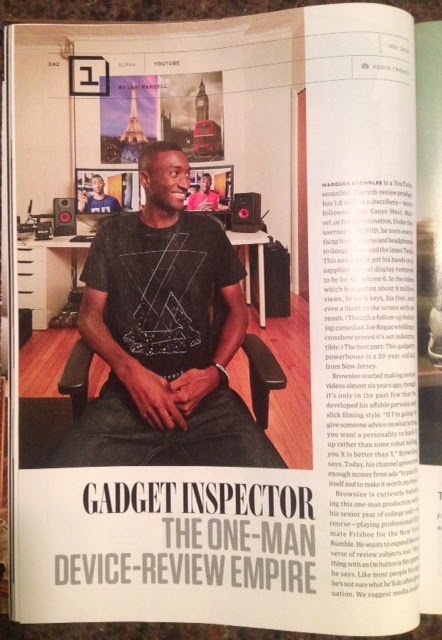 Marques Brownlee (aka MKBHD) is a Columbia High School graduate, a former New Jersey Hammerhead player (2013), a New York Rumble player (2014), and a Garden State club ultimate player, who was profiled due to his popular YouTube channel in the November 2014 issue of WIRED. The tech magazine boasts a circulation of 3 million. The backdrop of his portrait shows an on-screen MKBHD in his traditional outfit - an Ultimate top. The blue one is the classic DUMP + SWING shirt. Brownlee has been previously interviewed by Ultiworld (August 2013) & USA Today (September 2014). View his reviews. Text from the last paragraph in WIRED: "Brownlee is currently balancing this one-man production with his senior year of college and—of course—playing professional Ultimate Frisbee for the New York Rumble." Why the "of course" verbiage? Might it be because Ultimate is the new golf?? What an appropriate way to salute the troops by the Philadelphia AUDL team! Phoenix players Danny Bjorkman, Sam Esser, David Hampson, William Hoehne, Sam Morgan, Chris Schulze, Steve Rosso, Kyle Wolf, and accompanied by Steve Lienert (Head Coach) traveled to the South Pacific in conjunction with the Armed Forces Entertainment tour to spread and showcase the game of Ultimate. 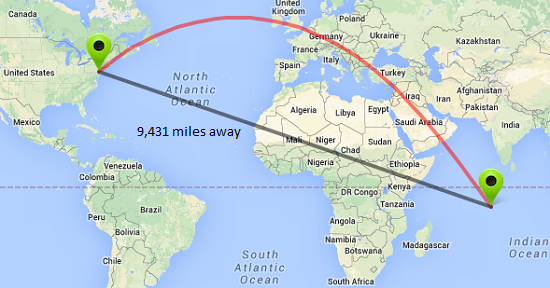 Follow the Phoenix's journey nearly 10,000 miles away from Philadelphia to U.S. Navy Naval Support Facility (NSF) Diego Garcia via Facebook. 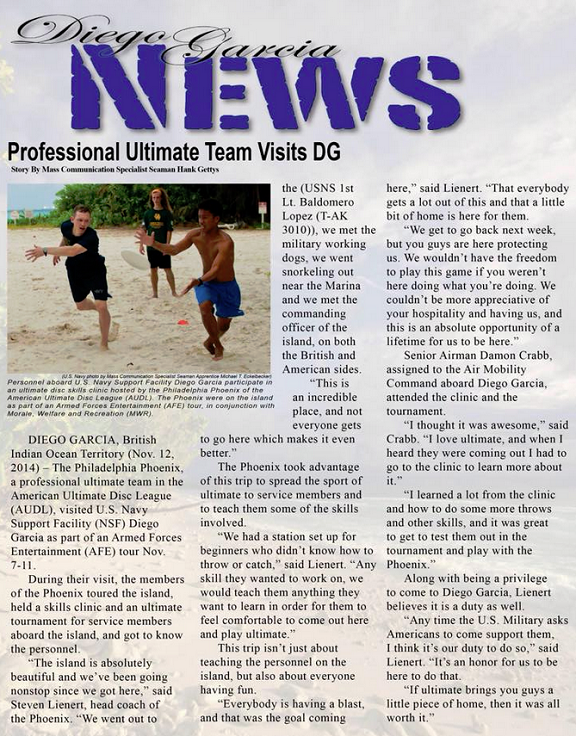 UPDATE (11/13): Phoenix made the front page of the Diego Garcia News! HC Leinert: "If ultimate brings you guys a little piece of home, then it was all worth it." 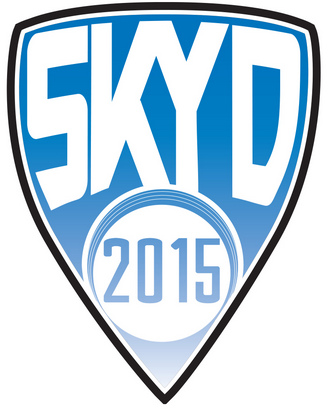 From its first post, Skyd's purpose was/is "to be a centralized resource for the latest in the sport and the culture. Our goal is to inform, inspire and continue to grow the sport of Ultimate through competent and reliable media coverage." Congrats on 4 years, Skyd! After one season playing on the cramped, unlined, AstroTurf field in College Park at University of Maryland, the DC Breeze announced they will play their home games of the AUDL 2015 season on Hotchkiss Field at Gallaudet University (800 Florida Ave NE, Washington, D.C. 20002). The GU turf field was updated in 2008, and the stadium capacity is 2,000. 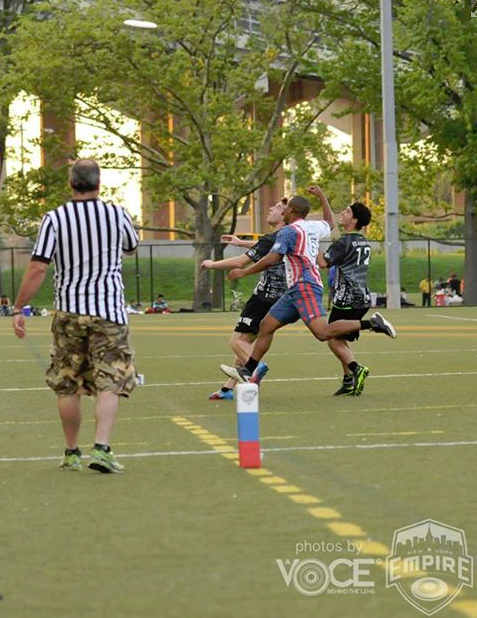 This is a return to playing in the District for the American Ultimate Disc League's DC team that played at Anacostia High School during their first (2013) season. 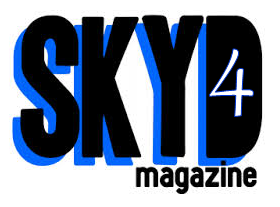 Skyd Magazine's annual campaign has begun. 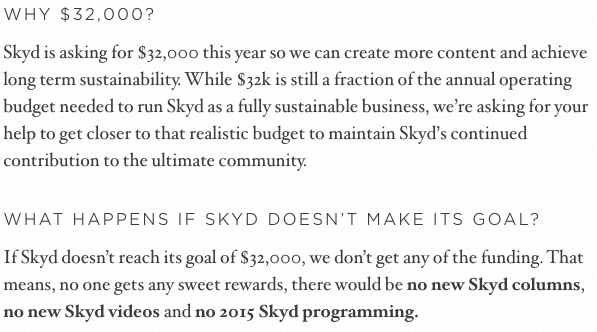 After an incredibly successful 2014, Skyd seeks to raise $32,000 ($32kYD) to cover their 2015 operational costs for writers, videos, staff and general admin stuff. 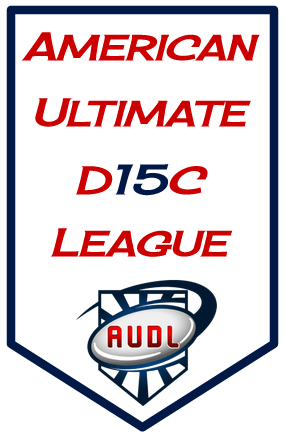 Show your support for this invaluable online portal for the sport of ultimate. Skyd Magazine keeps me up-up-updated on the regular. I expect it does the same for anyone else who plays/loves ultimate, so consider a donation of any size. On this date in 1972, the first intercollegiate Ultimate Frisbee game was played between Rutgers University and Princeton University. 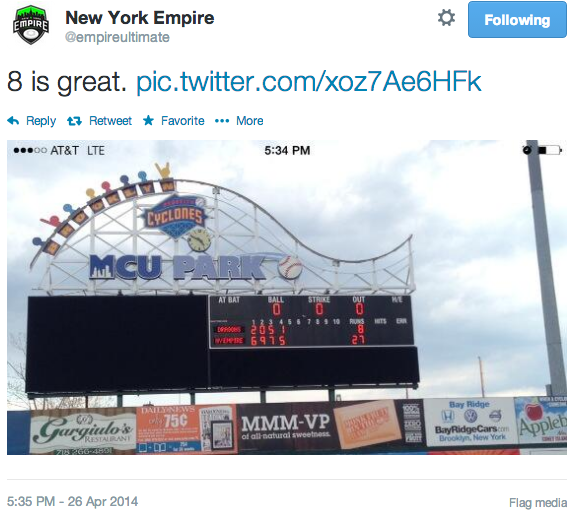 A crowd of "about 400" gathered to watch the match between these two colleges in New Jersey. 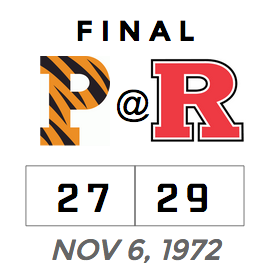 The November 6th game was organized by Irv Kalb – a Columbia High School graduate and a freshman student at Rutgers. 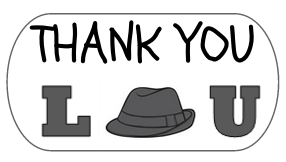 Lou Burruss, an author at Skyd Magazine, announced his decision to cease writing his column Win the Fields. 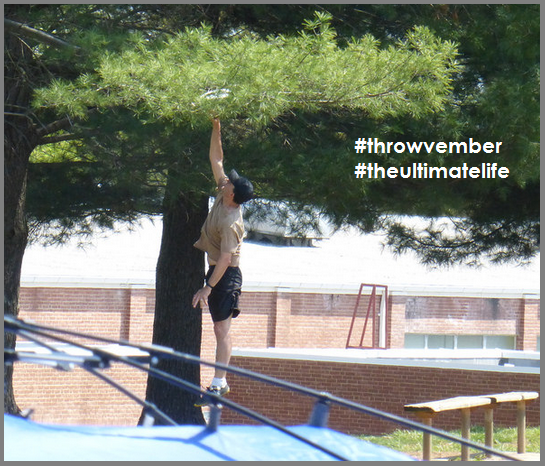 Since September 2011 at Skyd, Mr. Burruss has published incredible insight into this intricate sport of ultimate. His articles were always relevant and worth reading (and re-reading). For a summary, Ultiworld published a Top-10 of Lou's WtF articles. Thank you for sharing your words, thoughts, and expertise. 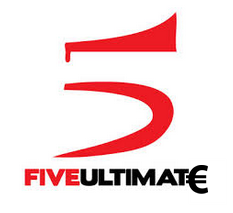 Five Ultimate, headquartered in Seattle, Washington, USA, is expanding operations into Europe. Five plans to have a store based in Amsterdam, Netherlands, and serve European customers. Now, how will "5" covert to metric standards?? 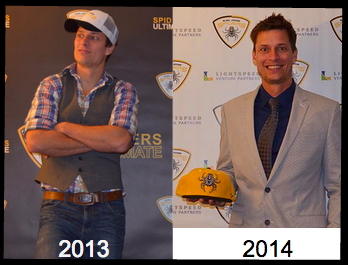 Beau Kittredge, AUDL 2014 MVP, will return to the AUDL 2014 Champions San Jose Spiders for the 2015 season. Beau signs with the Spiders in 2013 (left); in 2014 (right). Body Language I know arm-folding. I just got a free hat! The question remains whether his bobble head will be updated without the faux hawk. I CAN'T UNSEE THE BLACK MUSTACHE IN THIS T-SHIRT IMAGE!!! Is it in honor of Movember? Or, is it because the world's leading facial hair expert works at University of Toronto?? 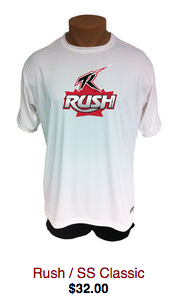 Or, is it a nod to the Toronto Rush's fan club - RUSHtache??? The Washington Post updates article to be "Current"